Read the trading & transfer market tips guide for FIFA Ultimate Team 18. Learn the best strategies to earn coins quick in FUT 18. This guide is featuring; snipe method filters, silver player investing, draft tactics and much more! 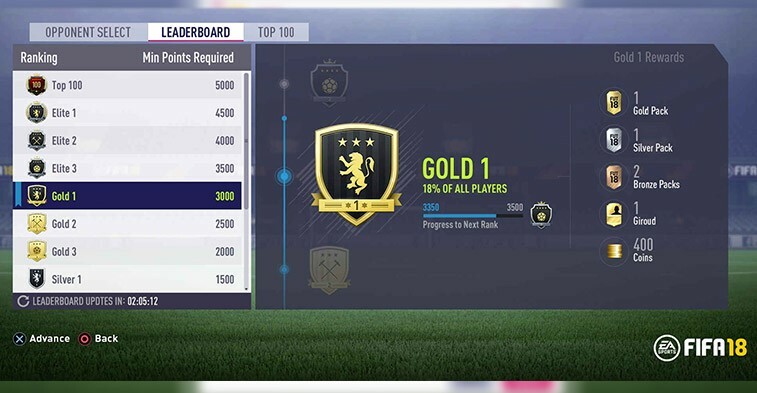 For one of the most effective methods in FUT 18 to earn coins, you aren’t even required to play matches to let the coins flow into your account. With the Premier Leagues, new players the Premier League is even more popular compared to the previous FUT game. In FUT 18 a lot of players want to build a Premier League squad. A good way to earn coins in FIFA FUT 18 is the defender method. – Select player quality: Gold. – Select League: Premier League. – Set the Buy Now price: 400 or 450 (Depends on the price ranges in FUT 18 and the console you’re playing FIFA on. (In the first months of FIFA 18 the value of the players are higher). Instantly buy the players cards that show up in the search results. Within a few seconds those cards will be sold so hurry and try to snipe the player cards. Repeat your search multiple times and snipe the premier league defenders. 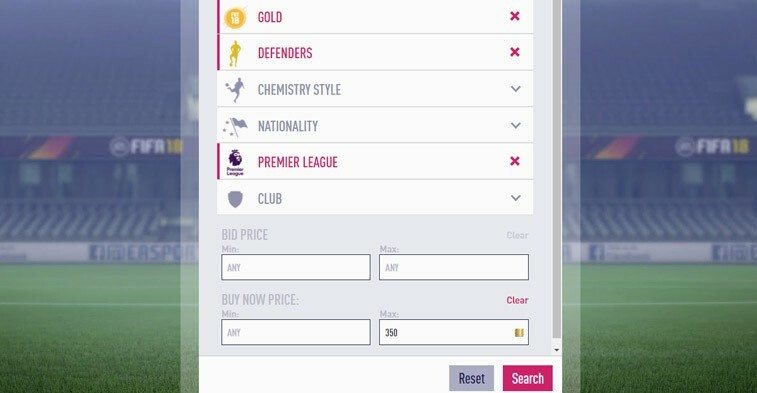 When no players show up during the search you’ll have to raise the buy now price. After you have received a list of 4 to 10 players you’ve got to sell the players. It is important you put the players on the transfer market for a higher buy now price. A few hundred coins higher should do. You will notice the players sell easy within one hour. You will have to repeat this method with dozens of players, which will make you earn thousands of coins within just a couple of hours. In march 2018 it’s time for a special SBC. The Irish players will be worth a lot for a few weeks. This is because of the national holiday of Ireland called, Saint Patrick’s Day. EA releases special SBC’s every year around this time of year. Fill your club with Irish players. Especially the silver and gold Irish cards will be worth a lot. Right now the prices are really low. Be smart and fill your club with many cold and silver Irish player cards. You won’t regret it in March. You are looking for a new way to play Ultimate Team? You would like to earn easy rewards and good coins? Then you should play the new Squad Battles mode in FUT18. Compete against teams from all over the world, created by community members. It’s the offline counterpart of FUT Champions with the same reward system. For a week you have to play as many games as possible (max 4 per day). Every day there will be a new list of new teams to play against. Winning is not the most important part of Squad Battles. The more difficult the teams you compete against, the better rewards you’ll receive. So don’t be afraid to start competing against World Class of Legendary team difficulty. Our advice would be: The offline gameplay is not that interesting like online. But just play a few games per week. You’ll reach level Bronze 2 of 1 easily and it gives you easy pack rewards every week. Not a famous method, however one that will give you profit for sure. many FUT 18 only focus on gold players, however many silver player cards have some sort of value as well. 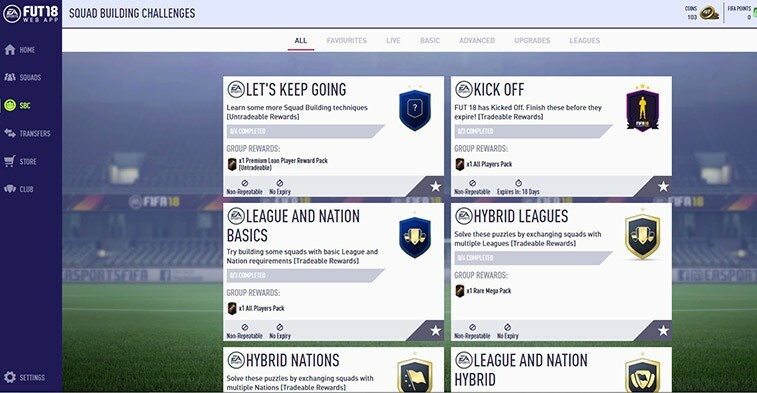 To earn coins in FUT 18 read the guide below. – Select Player Quality: Silver. – Set Buy Now Price: 200 or 250 (Depends on the price ranges in FUT 18 and the device you’re using. In the beginning the prices can be higher because of the popularity of the players). – Hit the search button. When the search button has been pressed many players will show up in the search results. Only purchase the player cards who fit the criteria described. You’ll need to buy a around ten player cards to increase the profit you make. After havin purchased the players you need to sell the players. 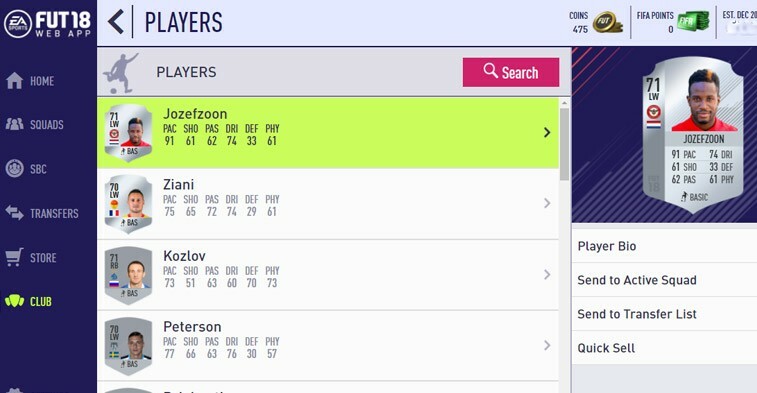 Do some research which players are worth a bit more than normal purchase prices. The other silver players can be sold easily for a couple of hundred coins extra on the transfer market. – Set Max Price: 250 or 300 coins (Depends on the price ranges in FUT 18 and the device you’re using. In the beginning the prices can be higher because of the popularity of the players). This method is almost the same as method one in FUT 18 however it works a bit different. – snipe rare silver cards with above average stats. Like; high pace, skill moves and high high work rates. Take a bid on the players who match with the criteria described above here. There is no need to use the BUY NOW button. You need to bid on every player with good statistics and wait for the transfer time to finish. This way many good silver players will be yours to won, and some will be outbid. Some players are worth quite an amount. You will need to do some research in FUT 18 on the cards you just bought. Some silver player cards are worth more because of the special stats. The additional Silver players can easily be sold for a little profit on the market. Many players complain that the Online draft is very difficult and the rewards are pretty poor. This mode is getting even more difficult after a few months. 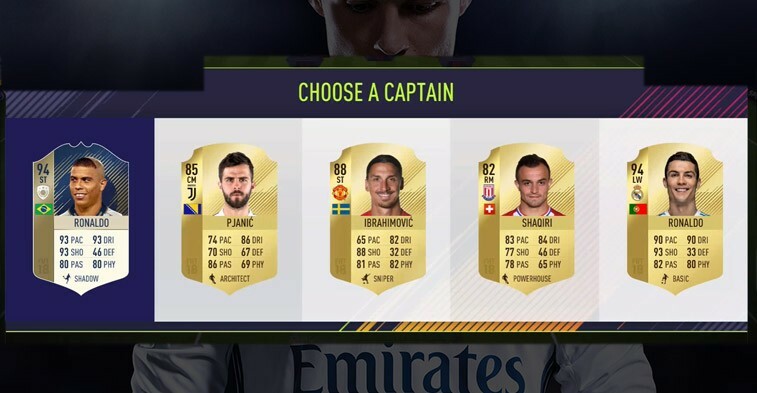 A clever way to earn packs and test your ‘pack luck’ in Ultimate Team 18 is to play the Offline Draft. You shouldn’t be surprised, but the packs you’re earning in the offline draft are pretty good and are saleable. On every player you sell EA will receive 5% tax. It’s not such a big problem when making a small sale/transfer. However with bigger transfers it is very important to take the 5% tax into consideration. An example: Buy a player card for 4500 coins. Sell player card for 4600 on the transfer market. You have just lost 125 coins. A good way to earn some coins in FIFA FUT 18 is trading with managers. The managers from the high end leagues will always sell players. And the funniest things is; most FUT18 players do not check what a manager card is worth. The trick is to search for the managers with rare cards in big leagues. Buy them and sell them with a small profit on the transfer market. 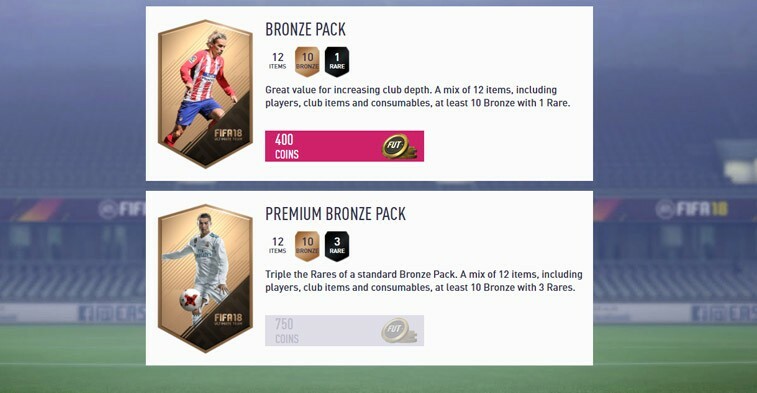 If you’re just a beginner or just started playing FUT 18 it’s a good idea to use the Bronze Pack Method. Open a couple of bronze packs for 400 or 750 coins and keep the coins flowing in. That is mostly because you’ll be receiving a lot consumable cards which are worth a few hundred coins (player fitness, squad fitness and healing cards). You should also check out the bronze players in the packs. Most bronze cards will sell for a couple of hundred coins when a Squad Building Challenges is active. Do not sell the bronze players who are worth nothing. Store them in your club and wait for the prices to rise. Or just use the bronze players for an upgrade SBC. Tips for FUT Champions. FUT Champions in FUT 18 is game mode full of frustration. It’s not easy to play against the best FIFA players in the world. You will not find the best players on the first slides of the transfer market in FUT 18. You can find the best players on the last ten minutes of the one hour transfer window. Select the player or item you want to get and forward until you have reached the 50th/55th minute. Look for the cards with the lowest price. This method shall save you a lot of coins. The best way to get rid of worthless players in FUT 18 is by completing squad building challenges. Most of the squad building challenges consist of making squads with players and get rewards in return for it. After submitting the squad the players you’ve used in those challenges will be gone forever. Thereby its advisable to only select the players you are not using anymore. Make sure to double check the squad before you submit anything. It would be very frustrating to lose one of your very best players. Also its important to think about all the rewards you will receive for making a squad. There are criteria with some challenges, which makes It harder to earn all the packs back that you will receive. FIFA can be quite a frustrating game every now and then. All those rage quits are only giving you a bad coin balance in the end of the day. Just try to score some goals and receive some good coins despite you will not win the game anymore. It’s definitely not everybody’s favorite, however it works really well in earning some easy (mostly untradeable packs or coins) rewards. You will need to check on a regular basis which offline divisions are active. Items from offline divisions are not sellable. A lot of players moved to new clubs past summer. You will notice that the most popular players have been moved to a better competition are worth more in FUT 18. You need to find out which players are the best to trade with. Chemistry is a really important factor, just like in the previous FIFA editions. Having the right players connected is a good start in getting your team playing in top condition. An important thing to know is that substitute players do not affect the chemistry level at all! So when you’re playing a tournament or players need rest, do not hesitate to put them on the side line. Firstly it is important to try to win with starting eleven, because it would be a waste to change a player at the starting of a match. When you notice it’s not working with the players you’re using, get your star players to work! Use LF and RF when playing the draft. When playing a draft, use the formations with Left Forward and Right Forward for Left Wing and Right Wing positions. This way you will have a higher chance of getting Ronaldo, Neymar, Messi and other top players. Because of all the good players this will give you a way better draft score, so you’ll be able to use the best players in the game.